People in this country have it tough on the health front between unrealistic body image expectations and amazing food we're expected to avoid for the sake of our figures. Couple all of that with the pathological need among my gender to be slimmer, stronger and sexier than the next chick and it's no wonder 10 million women develop an eating disorder and a love-hate relationship with the gym. Buying Wii Fit Plus won't fix any of that, sadly. But it's a giant leap in the right direction. Stat Tracking For The Whole Family: The original Wii Fit allows you to track an approximation of your weight, body mass index and calories burned per day. Wii Fit Plus lets you to do the same for toddlers and pets, extending the appeal of the game to the whole family. True, your pets and toddlers can't do any exercises to improve their weight. But it is a way to get youngsters started on healthy attitudes toward their bodies and a good way to annoy your animal, since you have to hold them while they're being measured. Fun Games For Multiplayer: Wii Fit Plus adds a ton of new games to the original line-up that challenge your heart rate, balance and coordination. What makes these games even more fun is the multiplayer mode Plus includes in your Wii Fit experience. For one thing, it that eliminates the back-out-choose-new-profile step you had to go through in the original game. For another, it turns all of the games like Super Hula Hoop and Tilt City into competitive smackdowns instead of weird ways to lose weight by flailing around in your living room. 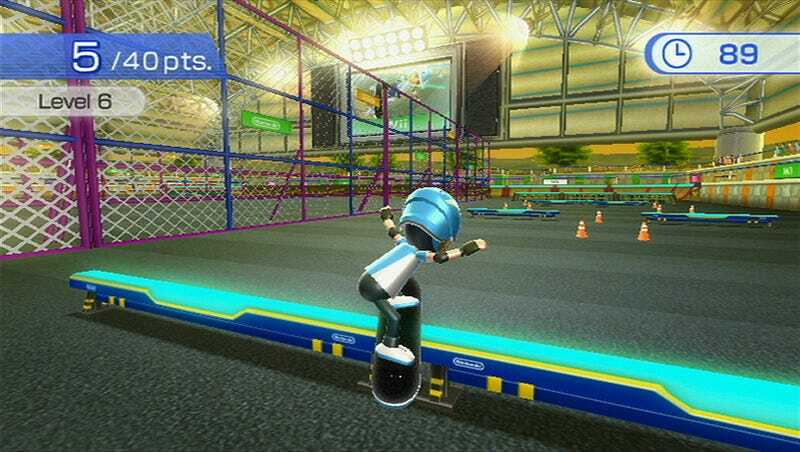 The Obstacle Course: The Obstacle Course is exactly what it sounds like: a course loaded with obstacles that you've got to run your Mii through using the Balance Board to track sprints, jumps and mad flailing if you get too close to an edge. At the Beginner level, the obstacle course looks like an early Mario 64 level with big Chain Chomp-looking balls swinging in your path and grassy fields to sprint across. At the Advanced level, it starts to look like a Bowser boss fight with moving platforms and shifting ice planes to navigate on your way to the finish. Honestly, re-skin the whole thing and you could have an actual 3D Super Mario Bros. game. Repetitive: I absolutely hate having the Balance Board or the Virtual Trainer say the exact same thing over and over again during an exercise. Yes, Virtual Person, I know the triceps extension tones your upper arms. That's why I'm doing it, so STFU and let me get on with it! Finicky On Some Balance Issues: In games like Rhythm Kung-Fu, Perfect 10 and the Obstacle Course, timing is everything. Which is why it's so frustrating when you pick up your left foot exactly when you're supposed to and the Balance Board doesn't track it. Or when you practically throw your back out trying to jut your hips forward to tag a mushroom in Perfect 10 and somehow the Balance Board thinks you went backwards. So frustrating! Wii Fit Age Measurements: Each day, Wii Fit asks you to complete a body test that measures your weight and BMI. It also subjects you to balance and quick-thinking tests that are supposed to measure your "age" in the way that Brain Age does. However, the balance and logic games that the test subjects you to are ones that you're probably not familiar with, so you're bound to mess them up on the first try, netting you a Wii Fit Age at least 10 years beyond what you actually are. It'd be nice if there were a way to access the games from the Training menu so at least you could get a feel for what the test will throw at you. Nintendo has been very careful to call Wii Fit a fitness "tool" not a fitness "solution" for obvious legal reasons. Neither Wii Fit nor its successor, Wii Fit Plus, will magically make you thinner or more easily able to resist tasty food. However, there's a lot to be said for a game that makes the very idea of fitness fun. It takes your mind off the anxieties about health we have in this country and reshapes your expectations of your body to something more positive than "Will I fit in my skinny jeans tonight?" With the multiplayer element and new games that Wii Fit Plus adds to the experience, I have to say, I've been converted from a skeptic to a believer. A believer with a 14 pound cat and a high score on the Obstacle Course. Wii Fit Plus was developed by Nintendo EAD and published by Nintendo for the Wii on October 4. The full kit with the Balance Board costs $100, but if you already own the Balance Board, you can get the box copy for $20. A copy of the game was given to us by the publisher for reviewing purposes. Played all of the games and tried all of the exercises in Strength and Yoga marked "New."